Tech Talk at SSCL – Page 174 – This site offers news and discussions about: technology, digital library content, online library resources, tech assistance available at the Southeast Steuben County Library – and sometimes we talk about books too! Chrome Browser Now Available for iPad & iPhone: Google Chrome iPad & iPhone users rejoice! There is finally an app for that! You can now download the free Google Chrome Browser for your iPhone or iPad from the app store. So if you like Chrome and have been eagerly awaiting its introduction as an Apple’s app – now is the time to download it! Library E-Books: Part IV: Today’s library e-book posting is going to focus on how you download free library e-books to Barnes & Noble’s Nooks. And I’m going to jump right into this subject by repeating what I said earlier last week about DRM and also noting two things you need to have access to before you begin the get-free-library-e-books-on-a-Nook process. 1) DRM: DRM, also known as Digital Rights Management software, is the reason that the download process for library e-books contains so many steps; and in fact, more steps if you have a Nook than if you have a Kindle or tablet. DRM is a restrictive software built into e-books at the insistence of publishers as an anti-piracy tool. And basically DRM locks library e-books and you have to go through a process to unlock the library e-books before you can read them. And in the case of the STLS Digital Catalog the software you need to unlock the e-books is called Adobe Digital Editions. 2) Two Things You Have Need To Have Access To Before You Begin The Get Free Library E-Books On A Nook Process: You have to have your own computer and you have to have an Internet connection. If you’ve read all the postings last week about public library e-books you may wonder why you need your own PC to check library e-books out to a Nook – because you don’t need that if you own a Kindle. And the reason for that is because Amazon actually unlocks the DRM software on library e-books sent to Kindles – that occurs when you log into the Amazon website. With Nooks you have to unlock the e-books yourself and that is why you need to have your own Internet connected computer and also why you have to download the Adobe Digital Editions software. So before you can begin the regular process of downloading free library e-books to a Nook – and that is the process you will use in the future – you have to go through a preparation process. 5) Click on the Download Adobe Digital Editions link or icon and the download process will start – you’ll be re-directed to the Adobe Digital Editions site. 6) Follow the prompts until the download process and the create-Adobe-account process is complete. 1) Plug your Nook into your computer and it should appear as a plugged in e-reading device within the Adobe Digital Editions Window. 6) Click the Add to Cart link and the My Cart page will display. 14) With most Nook models you will find the e-book in your documents folder – and you can then begin reading it! As this is a long process –and the library has actually created a video to assist Nook users in obtaining library e-books! And the video does show you step-by-step how to go through the preparation process by downloading the Adobe Digital Editions software and then it goes through the entire check out process – so please do check it out! The only little thing to note is that we have changed the title of the link to the Digital Catalog on our home page – it now says “STLS Digital Catalog” and in the video it is seen under the old title of “E-Books and Audio Books” – we updated the link when we added video and music formats to the catalog – so if you just remember that one little thing that has been changed – the video will easily guide you through the process of checking out e-books to your Nook! Library E-Books Part IV Posting Postponed Until Monday & Four Cool Tech Articles to Consider! Hi everyone, I’m a bit swamped today and so I’m not quite finished with my posting “Library E-Books: Part IV” which will discuss how you can download free library e-books to Nooks. I’ll finish that posting over the weekend and get it up on Monday morning. In the meantime for your consideration here are links to four tech articles that shed light on how technology is changing how we read and access entertainment. 1) E-Book Statistics: This first article is from the Wall Street Journal and is titled “Your E-Book Is Reading You: Digital-book publishers and retailers now know more about their readers than ever before. How that’s changing the experience of reading.” And it does indeed illustrate how publishers can learn more than ever before about what people read including what parts of the text they highlight, if they stop reading an e-book and how fast they read an e-book and purchase their next e-book. 2) Media Streaming Players: Article 2 is from CNET and is titled: “Apple TV vs. Roku vs. Nexus Q: Media streamers compared: Google’s Nexus Q is the newest kid on the streaming block. CNET puts it head-to-head with our favorite tried-and-true stalwarts, the Apple TV and the Roku.” Wow, what a mouthful of a title – it is certainly and in-depth one! And this article discusses the growing practice of what is known as media streaming and cord cutting – that is people who stream video content from the Internet and/or drop their cable package (cord cut) and stream TV shows and movies to that big HDTV in their living through set-top boxes like the Apple TV, Roku player and the new Google Nexus Q. 3) Happy Birthday to the iPhone: And believe it or not the iPhone turned 5 today! Unbelievably so as it seems you now see smart phones wherever you go! And that is what one would call a super fast adoption of a product! And today’s New York Times Bits blog features an article that discusses how the mainstream acceptance the iPhone changed our world by issuing in the smart phone era. 4) Why Windows is Killing the Start Menu for Windows 8: In the upcoming Windows software upgrade to Windows 8 – there is no long a Start Menu. That staple of the PC era is in the twilight of its time in the spot light. And PC Pro features an article that discusses why – essentially Windows did some research and discovered that people by far prefer to pin their favorite programs to the task bar or the desk top of their PCs where they can quickly access them, than to have them be on the Start Menu where they have to hunt to find them. As you may be aware the Southeast Steuben County Library in Corning, NY is a member of the Southern Tier Library system. And Southern Tier Library System member libraries buy e-books for the Digital Catalog through the library e-book vendor OverDrive. And OverDrive has created an app for all Apple, Android and Windows smartphones and tablets. You can find the app, which is officially called “OverDrive Media Console” in your respective app store. Enter your Library card number in the library card number field. Tomorrow I’ll discuss how you download library e-books to Nooks and one of next weeks’ postings will be on how you download audio books and media (music and videos) from the Digital Catalog. *1) If your tablet is a Wi-Fi only model you will have to be within range of a Wi-Fi network in order to download library e-books. *2) You can download MP3 audio books to all Windows, Android and Apple smartphones and tablets; however, WMA (Windows Media Player) audio books can only be directly downloaded to Windows smartphones and tablets. 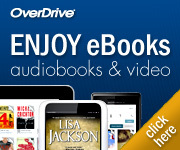 If you have another wireless device you should be able to download the PC version of OverDrive Media Console to your computer, download WMA audio books to it and then transfer those to Apple or Android mobile devices. Unfortunately if your main computer is a Mac – you cannot download WMA audio books to it and transfer them to mobile devices; the process will only work if you’re using a Windows PC. Today Google jumped into the tablet and media streaming market by introducing a 7” tablet called the Nexus 7 and a media streaming player called the Nexus Q. The Nexus 7 will be a Wi-Fi tablet, have a 1280 x 800 HD display, have Bluetooth capability, will be running the latest Google OS Jelly Bean and have a front facing camera for video chatting. It will go on sale in July and cost $199. Here’s a link to an interactive CNET review of the Nexus 7 if you’d like to see what it looks like! The Google Nexus Q streaming media player will join media players like the Apple TV and Roku boxes. It will stream music and videos from the Android/Google cloud to your television or speakers and can be controlled by Android tablets and smartphones. It will list for $299 and will also go on sale in July. A Bit About DRM: Before I jump into the subject of how you download free library e-books to a Kindle; I have to point out that the process you use to download free library e-books to tablets, smartphones, e-readers, Macs and PCs is a bit different depending upon which device you are downloading library e-books to. And you may wonder why that is – Why are there so many different ways to download library e-books? And the answer to that is that the main reason is because of something called Digital Rights Management software. Digital Rights Management software, or DRM for short, is built into e-books by publishers. It is an anti-piracy tool and the intent is that it is supposed to make it hard or impossible for people to illegally copy and distribute e-books. However, the practical side of the equation for patrons of public libraries is that DRM makes it more difficult to download library e-books to e-reading devices than it is to buy e-books from an e-book seller. And the difference is because some how the DRM software has to be unlocked from the library e-book you’re downloading so you can read it – think of the book as being in jail and unlocking the DRM springs it so it can travel to your e-reader! In contrast, if you buy an e-book from a bookseller, and assuming you already have done the prep work of setting up an account with the bookseller, than the download process is simple – you click a button that says “buy” and then enter a user ID (usually an email address) and your password and boom! The e-book downloads to your e-reading device in just a few seconds. It is literally that fast! And library e-books too download that fast – once you go through the process of unlocking the DRM software. And if you read through that multi step process than you can see there are few more hoops to jump through, courtesy of publishers, to obtain library e-books – but the process to download Library e-books to Kindles doesn’t really require that many steps just a few more than if you were to purchase an Amazon e-book. The First Generation Kindle: The download process for the first generation Kindle, those are the ones from 2007, is a longer process that the 14 step process listed above. However, you can indeed download library e-books to a first generation! There is more pre-work involved but it can indeed be done. You have to have your own internet connected computer, download a piece of software called Adobe Digital Editions from our website and set up the software on your PC and then plug your first generation Nook into your PC before opening a web browser and going to the Digital Catalog, accessed through the library’s homepage, to look for a book to read. And the in essence what happens is that the e-book downloads to your computer and loads into the Adobe Digital Editions page where your first gen Kindle will be displayed as the e-reader you have plugged into your computer. And did I mention before that you can call the library and set up an appointment to go through the library e-book download process with a tech staff member? You can! Call us at 607-936-3713! You can even come in and check out the e-reading devices and tablets the library has for in-house use – just in case you’d like to window shop before you buy a e-reader or tablet. And on a related e-reader subject very shortly, you’ll even be able to check out pre-loaded e-readers here at the library – and those are very simple to use because there is no download process – the e-books will already be on the e-readers! And circulating e-readers will be coming in July so I’ll discuss that topic in more depth as soon as our pre-loaded e-readers are available to circulate. And tomorrow I’ll discuss how you download library e-books to tablets and smartphones via the OverDrive app. And on Friday we’ll go over how you download library e-books to Nooks – so stay tuned! And please feel free to visit our Youtube page and check out our How To Download Library e-books videos! Just remember the one little change in those very in-depth, step-by-step how to videos is that the E-Books and Audio Books link found on our homepage (that’s the one that you click on to access the Digital Catalog) is now called “STLS Digital Catalog” to illustrate the fact that the Digital Catalog now offers a handful of video and music titles to download as well as e-books and audio books. And that answer to that question is a resounding yes! We have e-books in our collection that you can download to any PC or Mac and also to a variety of e-reading devices. So if you have a PC or Mac you can simply download the required e-reading software to your desktop or laptop and check out e-books that way! And of course you can also check out library e-books, free of charge, to Apple, Android and Windows smart phones as well as to tablets like the iPad and Galaxy 2 S. And you can additionally check out library e-books to most dedicated e-readers including all of Amazon’s Kindles and all of Barnes & Noble’s Nooks. If you have an Android, Windows or Apple tablet or smart phone then as the expression goes – there is an app for that! Most public libraries, including ours (The Southeast Steuben County Library in Corning, NY) use the OverDrive platform to offer their patrons e-books and so the app is called OverDrive Media Console and the app artwork features a big thin O over a blue background – the app can be found in the Android Marketplace and Apple’s App Store. The how to download library e-books videos are quite new and offer a step by step explanation of how you download library e-books to Kindles or Nooks. I will point out one little change though from what the videos say – to access our Digital Catalog you used to have to go to the library’s home page found at SSCLIBRARY.ORG and then click on the green E-Books & Audio Books link located on the right hand side of the page – that link description has been changed because we recently added downloadable videos (mostly for kids) and a handful of downloadable music to the Digital Catalog – so now that link features a green background and says in white lettering “STLS Digital Catalog” so if you simply remember that and follow the instructions in the videos then that too will guide you through the e-book download process. If you have any questions about this blog posting let me know! That is a question we frequently hear at the library! And my answer to that question is that that it depends upon what you want to do with your e-reader! And that may sound strange. You may think “But don’t you just read e-books on an e-reader?” And the answer to that question is not necessarily! Certainly the most inexpensive e-ink e-readers offer you the ability to read e-books and not much more. V. About Prices, i.e. how much is it going to cost me! I) Types of E-Readers E-Ink Versus Backlight/Color Screen E-Readers: When you’re looking to purchase an e-reading device you need to start out by being aware that there are two basic types of e-reading devices at the present time and one new type recently debuted by Barnes & Noble! There are e-ink e-readers, backlight/color screen e-readers and the new B&N Nook Simple Touch with Glowlight which is the only e-ink e-reader currently on the market that has a built in lighting system. 1) E-Ink E-readers: These e-readers feature black text on a light gray screen. And they are the ones you can take outside and use to read e-books in bright sunlight at the beach or the lake. And when you’re indoors you need to sit next to a lamp when using one of these e-readers just like you would if you were reading a print book. 2) Backlight/Color Screen E-Readers: These e-readers feature black text on a white background (just like a computer background – for example, if you go to Google.com the bright white background of that page is a good illustration of the white of a backlight screen) and although these e-readers aren’t easy to use in sunlight, because the sun glares off the backlight screen, they are wonderful if you like to read indoors because you need never again worry about sitting next to the best reading lamp in the room– and you can even sit in the dark and easily read e-books on a backlight screen. These backlight screens also feature color so you can look at magazines or book illustrations or surf the internet in living color. So those are the basic types of e-readers in terms of the hardware, or if you like the machinery, of the devices goes. The other big aspect of e-readers consists of their features and that gets us back to my initial answer to the question of which e-e-reader is the best one to buy; because once you decide whether or not you prefer an e-reader with an e-ink screen or a backlight screen that can display color then the ballgame is all about the features. You can read e-books and popular magazines on these e-readers.As previously mentioned, these e-readers feature an e-ink screen and you can use them to easily read books or magazines in bright sunlight at the beach, in the car or at the lake etc. You can easily increase the size of text turning all e-books into large print books. This category of e-reading device offers you a choice between having a keyboard, or physical rocker input to use when typing in search terms (i.e. the author or title of a book you are looking for) or a touch screen. This category of e-readers also includes the Nook Glowlight an e-ink e-reader that as mentioned has all of the above features and an internal light for night reading. You can read e-books and popular magazines on these e-readers. These e-readers feature a color backlight screen so illustrations and photos in books and magazines are rendered in color instead of black and gray as is the case with e-ink e-readers. You can easily increase the six of text turning all e-books into large print books. These e-readers weight more than e-ink e-readers usually between 1 pound and 1.5 pounds so they feel more solid in your hands. You can easily read e-books on these in an in-door setting without concern for lighting because the screen has a light behind it and thus these e-reading devices can be easily read upon in low light or even in the dark. You can set up, read and send email on these e-readers. 3 G: Some e-ink e-readers feature 3G connectivity. And what that means is that those e-ink e-readers connect to their e-book seller’s store via the cell phone network. There is no extra charge to use this feature on an e-reader; it is a free service that comes with the e-reader and it allows you to download e-books to your e-reader from almost anywhere across the globe. Wi-Fi: And many e-ink and backlight screen e-readers have built in Wi-Fi. And what that means is that you have to be in-range of a wireless internet connection to download new e-books from your e-bookseller. Once e-books are downloaded to a Wi-Fi e-reader than you can go anywhere and read those e-books and you don’t have to be within range of a wireless internet connection. However, in order to download the e-books to your e-reader initially, you must have access to an internet connection. You can either set up a wireless internet connection at your home or have your internet service provider do it, or access the internet from a public internet connection. And there are many local places where you can go to get free internet – our library is one (and most public libraries too! ), Wegmans, McDonalds, Bob Evans or even The Central – they all have free public Wi-Fi so you don’t actually have to pay for an internet connection to use these devices. And notably, all the backlight color screen e-readers are Wi-Fi only devices – it is only when you upgrade to the tablet level that you can get a device that offers both 3 G and Wi-Fi – and the 3G for tablets, unlike e-ink e-readers – does cost you – there is a monthly fee which varied depending upon your cellular service provider and which tablet you buy. IV. What About Tablets? Tablets like Apple’s iPad (9.7” display; entry level price for Wi-Fi version $499), the Motorola Zoom (10.01” display; entry level price $499) and the Samsung Galaxy 2 (10.1” screen; entry level price $399) are wonderful devices upon which to read e-books. However, they are alos like backlight e-readers on steroids as the expression goes – because although you can read e-books upon them and from multiple sources (there are apps to obtain e-books from Apple, Amazon, Barnes & Noble, your public library (OverDrive) and other e-book sellers), they feature larger screens than e-ink e-readers, you can set them up so you can read and write e-mail on them, do word processing, create presentations, watch movies and TV shows, listen to audio books and music and download many apps —more apps by far than are available for the Kindle Fire or B&N Color or Nook Tablet. Tablet apps are available in general categories that include: games, social networking, news, weather, business and entertainment. And notably, there are more apps for Apple’s iPad than any other tablet so if you decide that you really like what you can do with apps you may want to consider buying a tablet to double as an e-reader instead of purchase a dedicated e-reader. V. Cost AKA How much is it going to cost me? Dedicated e-ink e-book readers – those are the ones that feature black text on a light gray screen and allow you to read e-books and that is basically it – start at around $79 and go on up in price to top out at $379 for the Kindle DX with the 9.7”screen. Amazon’s entry level Kindle with Special Offers (the Special Offers are screen saver ads!) costs: $79 and allows users to enter information by utilizing a physical rocker. The entry level Barnes & Noble Simple Touch Nook costs $99 and features a touch screen. Both devices are Wi-Fi only. If you prefer a physical keyboard there is the Kindle Keyboard (again an e-ink e-reader) that costs $139 for either the 3 G or Wi-Fi model. And if you like backlight color screens Amazon offers the Kindle Fire for $199 and Barnes & Noble offers the Nook Color for $169 and the Nook Tablet for $199. All three of those devices include a web browser, the option to set up, send and receive email and the ability to download apps. The main difference between the Kindle Fire, The Nook Color and the Nook Tablet is that the Kindle Fire is tied into Amazon’s ecosystem and this allows you to rent or buy movies or TV shows, music and audio books from Amazon and watch or listen to them on your Kindle Fire. Barnes & Noble on the other hand does not have a music, video or audio book store so you cannot purchase music, audio books, movies or TV shows from Barnes & Noble and watch them on your Nook Color or Tablet. If you have questions about any of the information I’ve relayed in this posting feel free to post a comment, call the library and pitch your question over the phone or stop by and pitch your question in person! And tomorrow I’m going to follow up this posting with one that discusses the different ways you download library e-books to your e-reader or tablet – which varies depending upon which e-reading device you own. And Also of Note: We have e-reading devices at the library that include e-ink e-readers, e-readers with backlight/color screens and iPads – they are here at the library for patrons to come in and try out – so please let us know if you’d like to come in and take a look at our e-reading devices before you buy one! Our telephone number here is: 936-3173. *1 There is one huge exception to the small e-ink e-reader size rule – the Kindle DX which is the only large E-ink reader – it features a 9.7 inch screen (that is the same size as the iPad), has a keyboard and costs $379.